This film is a powerful look at one family’s story of their father’s courageous 33-year battle with Parkinson’s disease. 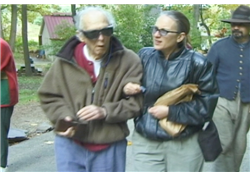 Personalized with old home movies, and family photos, the film chronicles both the father’s determination to not give in to his debilitating illness, and the family’s endeavors to provide the best care for him. The film skillfully captures the person behind the illness–we see Louie’s spirited attitude triumph over the daily challenges of Parkinson’s as he contends with hallucinations, falls, hand tremors, and a gradual loss of body control. The family caregiving dynamic is also explored as we see the family members struggle with their new roles as adult caregivers to their father while they balance careers and families of their own. A must-see for caregivers and family members of anyone with a chronic illness.